Now Feldenkrais in Nia is not so much a movement as it is the feeling, the sensation of movement. With this technique as our guide we slow down, we become aware, we witness our movement. The creators of Nia wanted a movement form that resulted in health, both physical and mental. 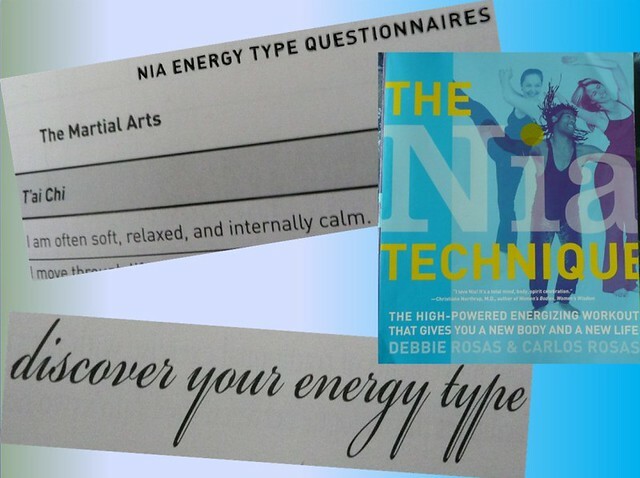 The Feldenkrais technique is specific and Nia does not claim to practice this technique, instead the idea of being able to create change in the body, by moving it and by focusing on the movement is what is incorporated into Nia. The idea of change being possible. The idea of slowing down and paying attention. Or even if going fast—the idea is to pay attention. I like to refer to Nia as a body-mind* practice/exercise/workout, because in White Belt we are instructed to go to the body. Moving in the body’s way and in our own body’s way in particular is one reason why I think of it as body-mind. But even though we go to the body that does not mean that we are not being aware. We need to use our mind to listen to the body. If a movement is being done in class and you copy it exactly, you need to be aware of the sensation your body is returning back to you. Is doing the move EXACTLY how the teacher is doing it really what YOUR body needs? Do you need to do it bigger? Or smaller? What is it that YOUR body is telling you? Adding some of the concepts of Moshe Feldenkrais adds body awareness to Nia. We feel the body as it moves. We respond to it, we are aware of it. We are connected to our bodies. It is somatic movement. It is movement with ease. This is how a Nia workout includes elements from Feldenkrais.